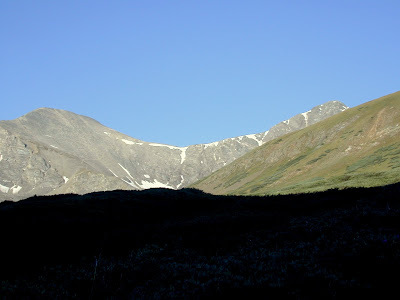 Grays (14270 ft) and, Torries (14267 ft) are two sister peaks separated by about 1/2 mile saddle. They are located about 40 miles west of Denver and just south of I70. 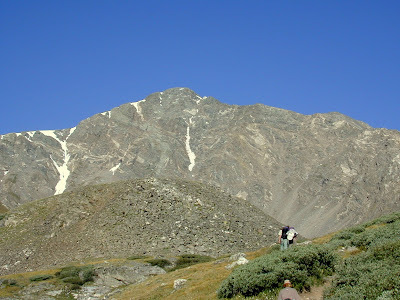 Its considered a double you can hit both 14,000 foot peaks in a one day hike. We got up and left the house in Colorado Springs about 4:00am in the morning for this hike. We drove to Denver then west to the trailhead arriving just as the sun started shining over the top of the valley. The road up to the parking area is long and rough. While you can get there in a car a 4 wheel drive is an advantage. When we arrived it was a weekend and it was crowded. If you get there any later than 7:00am on a summer weekend you will not find any parking. The beginning of the trail is flat and meanders through the valley for a mile or so on a shallow incline. As you face west you can see the Peaks of Grays on the left and Torries on the right in the sunshine as you walk out of the shadows cast by the valley surrounding you. Along the south side of the trail is a beautiful meadow and a small creek that drains the snow still on the sides of the mountains. At the top of the meadow you get a picture of what is in store. The beautiful flowers end, and the broken rubble and rocks stretch forward for miles. 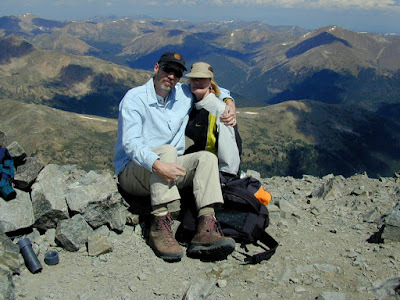 As you work your way to the top of the saddle at 13,720 feet the trail splits. you can go right to Torries (pictured below) or to the left and Grays. We went to the left Grays and started the endless mind numbing series of switchbacks that never seems to end. At last we summit at the top of Grays. Here you find a few people huddled behind some piled up rocks avoiding the strong wind that blows at 14,000 feet. Looking Down to the north you get a good view of the saddle crossing to Torries and a preview of what is to come over the next couple of hours as we descend to the saddle and back up to Torries for a second 14,000 ft summit in one day. It doesn't look so far away does it? As you start to ascend Torries you can see that the illusion in the above photo is that Torries is a pretty green and smooth surface on one side. However as the photo below show as you near the top its nothing but broken rock scrambling. The closer you get to the top the larger the rocks are that you have to scramble over. 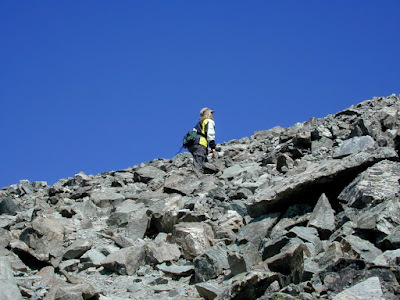 Margaret “The Machine” plods onward each step sometimes 2 feet high to reach the next rock. At last the top! Two peaks in one day, and another kind soul to take our picture. 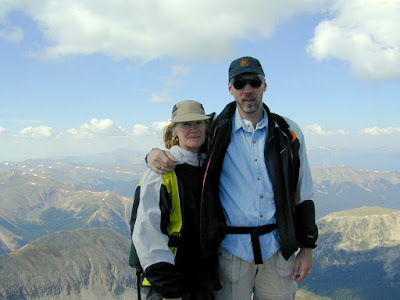 From here you can see many of the 14,000 foot peaks in the area Bierstadt and evens in the east and others to the north and west. From the top of Torries looking back towards Grays you can see the endless switchback trails carved into the face of the mountain as we head back down to the saddle. As we arrived at the saddle for our turn towards the trailhead we happened across this fellow hiker munching on the moss in the rocks .